Since the 1950s, the Noell family has always had a knack for selling different types of items such as oil, truck parts, and sporting goods. In 2002, Dennis and Kay Noell, owners of one of the best truck accessories shops in Northeast Arkansas since ‘87, decided to open a small 1,000-square-foot sporting goods store on the side of the truck accessories shop. 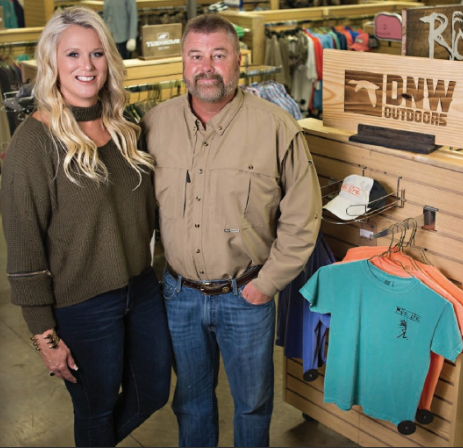 Little did they know, DNW Outdoors would become one of the top sporting goods stores in the state of Arkansas and has now grown to a 30,000-square-foot location sharing the passion for hunting and fishing all around the United States. DNW Outdoors is proud to carry some of the top brands in the industry including clothing brands like Columbia, Drake, Banded, Under Armour and Sitka. Not only does DNW provide its customers with hunting apparel, but also carries great casual brands like Southern Tide, Vineyard Vines, Southern Proper, and many more. DNW is loaded with guns from Benelli, Beretta, Winchester, Stoeger, Ruger, Smith & Wesson, Sig Sauer, and many more. If we don’t have it, we can most likely get it. Whether you are hunting big game in the mountains, wading wader in the Arkansas green timber, sitting up in a tree waiting on that monster buck, or laid back in a boat waiting on that big bass to bite, we have the gear to get you prepared for the memories that will last a lifetime.